I don't remember the last time we bought hummus from the supermarket. I have always made it at home ever since I have realised how simple it is to make. I usually make a plain hummus (recipe here) to snack on with some veg or bread. You can also add different spices or veg while making hummus. I usually like adding cumin to my hummus and my current favourite is roasted red pepper hummus. Roasting the red pepper gives it a depth of flavour. This tasted so good with some home made toasted bread! Preheat the oven to 180 C. Place the diced red pepper on a baking tray. Drizzle with a little bit of oil and roast for 35- 40 mins. Check on them and toss them around halfway so they cook evenly. 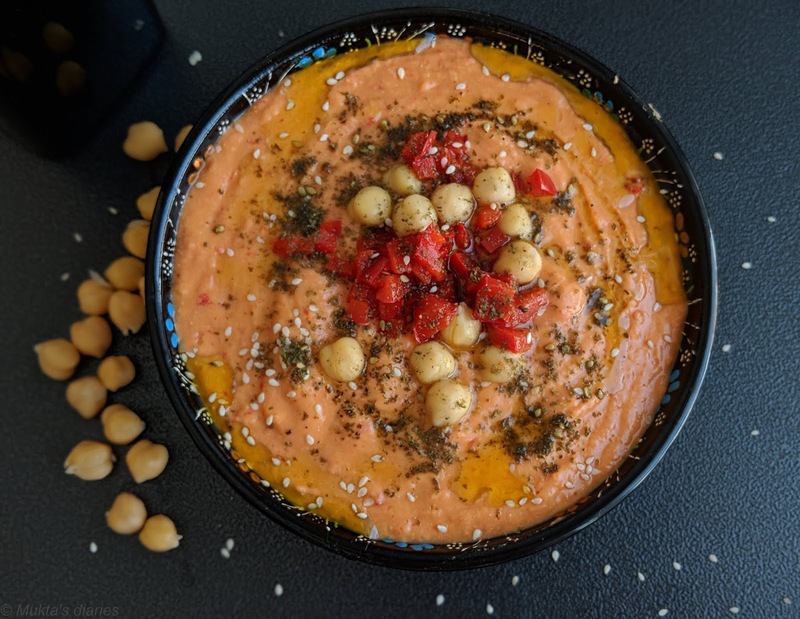 In a food processor, add the can of chickpeas, the garlic cloves, tahini paste, lemon juice, salt, roasted pepper and about 2 tbsp of water from the chickpeas can. Turn the food processor on and pour in the oil slowly until it is combined. Check for seasoning. Drizzle with some extra virgin oil before serving.